Walter Mitty (played by Ben Stiller, who also directed the film) is a negative assets manager for Life Magazine who frequently daydreams of fantastic adventures, and has a crush on his coworker Cheryl (played by Kristen Wiig). For the final issue of Life, photographer Sean O’Connell (played by Sean Penn) sends Mitty 25 negatives and says that the 25th one captures the “Quintessence” of Life and that it should be used for the cover. The 25th one, though, is missing, so Mitty must track down O’Connell and travel the world, and makes some stops, including Greenland, Iceland and the Himalayas. I was not disappointed by this movie, since I was very excited about it when I first saw the trailer. 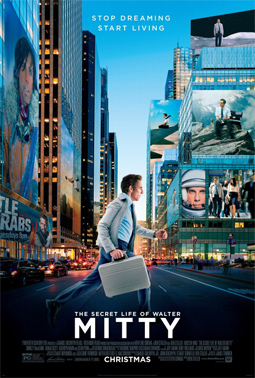 Walter Mitty is filled with comedy and heart, but some parts are a little slower than others. The film has a great plot and great cinematography, but Mitty never really changes throughout the movie. Instead of becoming a better person who doesn’t daydream that often, all he really does is travel the world and make a new friend (an eHarmony employee). I think adults would like this movie just like I did, but it does have some iffy content that might be intense for kids, including some violent scenes and swearing, despite its PG rating. It deserves a PG-13 rating, but I think it would be appropriate for kids 12 and up. Here is the film’s trailer. This entry was posted in Action, Comedy, Drama. Bookmark the permalink. When did you get to see this movie? I hope you save a movie or two for when I come to visit. As for this movie, I have read a little about it and I am not sure that I would like to see it. It seems a bit shallow and superficial and, though it compares itself to ‘Forest Gump’ (in the ad. ), I think it lacks the grace and humor of the latter. Anyway, since Walter Mitty has to travel the world to find the 25th picture, you get to see some beautiful and remote sights, and, along with the special effects, this in itself is good entertainment. I think you were right to give it 3 pizza slices. I cannot wait until you arrive in the US in a couple of weeks. I did save a couple movies for you: an action movie starring Kevin Costner titled 3 Days to Kill , and Non-Stop, an action movie starring Liam Neeson.